The 2017 edition of the PA Randonneurs Fléche gets under way today as the first of nine teams (Fleshe Eating Rumble Ponies) sets out toward our unofficial clubhouse at the Weisel Hostel near Quakertown, PA. The remaining teams will be starting Saturday morning with plans to arrive for a post-fléche breakfast on Sunday morning. Below are the routes each team plans to follow to reach the hostel. A few of the teams have SPOT trackers so you can watch their progress when you know you'd rather be riding. We wish all riders a fun and safe journey! The flèche roster has been updated with entries received through April 4 and posted on the website. You must notify me of any last-minute roster changes TODAY. I am still waiting for several registration forms in the mail. If your registration shows as pending on the roster, you must email me to confirm that you plan to ride. The roster will be finalized later today. 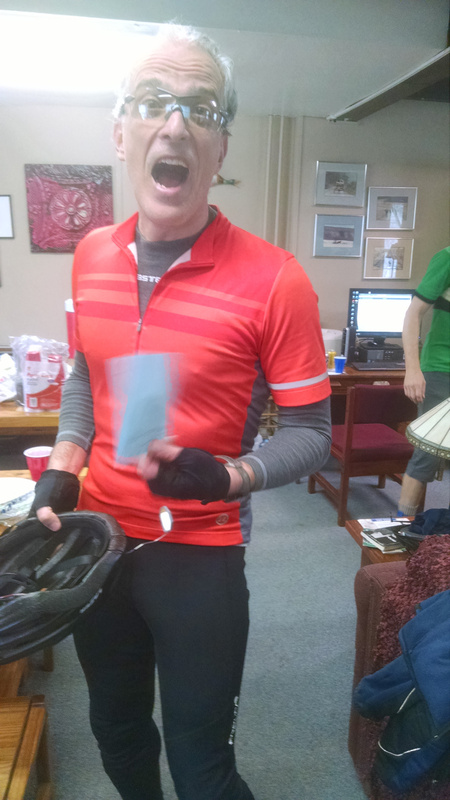 Captains should have received either an email containing print masters for the brevet cards or a package in the mail containing the cards. If you have not received these, please contact me immediately. Finally, if you have any remaining questions just ask. Captains, please review the roster to assure that I have the correct team and start time. Riders, if you have not yet sent in your registration, please do so at your earliest convenience. If you have NOT mailed your entry to me already, please send me an email confirming your intention. There are a few individuals for whom I have little contact information. Gooseeggs in the roster means I do not have key information. You can always use the Event Registration Form to provide this information easily. Follow this post as I will be incorporating route maps showing each team's planned route leading to the hostel. Two routes remain under review, mostly due to my being behind schedule. Breakfast plans for Sunday morning are already in the works. Past participants know what to expect. New riders will not go away hungry. Finally, as many of you participated in the 2016 flèche and may be wondering about the results, I will be placing the 2016 year-end packages in the mail today. All of your 2016 PA Randonneurs brevet cards, flèche certificate, and the year-end results letter are included. Apparently our flèche certificates were placed on a very slow boat from France. A pre-ride of the Lackawanna 200K was completed on Tuesday, 21 March. The Hostel parking lot was mostly clear of snow. There were some mushy areas but I was able to park easily without needing to engage 4WD. At 6AM I set off in the dark in a light drizzle at 37F. Although the course is generally beautiful, with quiet roads and many interesting sights, it begins with some tense drama almost immediately after leaving the Hostel. Starting from the left turn at the TFL onto Rt 313 (mile 1.6) the shoulder is rough, and so is the main lane. The potholes filled with water are hard to see through the glare of oncoming headlights. Worse yet, there are detour signs with sandbag bases blocking the shoulder at intervals, forcing you into the lane. State highway 313 should be relatively quiet 6AM Saturday, but at any time of the day or night it can have platoons of cars zooming by at 50+ mph. We ride this segment before dawn. Please ride single file and provide a good space cushion between riders. Don't ride faster than your guardian angel OR faster than the range of your headlight. Make sure your taillight is on and your reflective gear is worn correctly. Inexperienced night riders should be extra cautious. 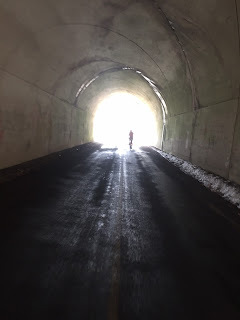 Approaching the next light at the top of the climb (2.8 mi), carefully get into the left lane. The turn here onto Ridge Rd is marked the "Car Detour" for 313. After completing the turn onto Ridge Rd, the drama abates. Although there isn't much of a shoulder on Ridge, traffic is low and visibility is good. You will have a generally calm ride for the next few miles. At about mile 8, where Ridge Rd starts to descend to the creek, you'll hear the roaring water going over the Nokamixon dam. Your speed will increase and the number of potholes will also increase. It still will be before dawn. Once again, please don't ride faster than you can see ahead to avoid potholes. 62.0 The Jct of Rt 612 is unmarked. Look instead for the Breyers Ice Cream sign above Chrusz's Store on the right. 117.9 Stoney Garden is freshly paved. The smoothest road of the day. Sadly, some of the roads before and after Stoney Garden have a few potholes. No substantive cue sheet changes were made. Now that winter brevets are behind us and hopefully winter itself will soon depart, it's time to turn our attention to the ACP events. 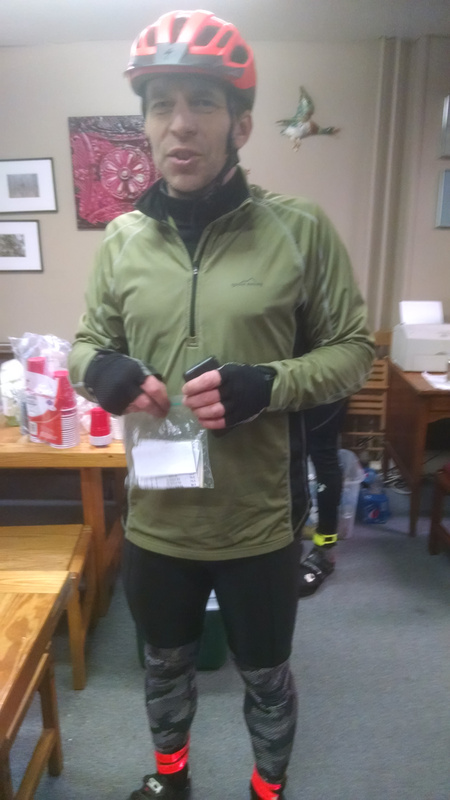 First up is the Lackawanna 200k on March 25, starting from our rando clubhouse at the Weisel Hostel near Quakertown. Event details have been posted on the website. If you're considering the fleche, please remember that the deadlines are fast approaching. Details are also available on the PA Randonneurs website. Routes are due by 3/24. If your route shows pending, please send it to me (or resend). If your start time shows TBD, drop me a line and enlighten me. Finally, for those of you who finished the fleche in 2016, I am still waiting to receive the certifications from RUSA/ACP and will mail your entire 2016 package of brevet results once those arrive. Still no official word on a forecast date.